I'm sorry, I know I keep talking about things that aren't technology related but something has been bugging me. 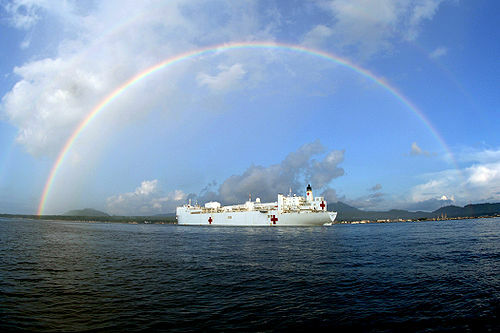 The stunning US Navy photo above of the USNS Mercy framed with a rainbow might give you an indication on what this post will be about, if you couldn't discern from the title. I'm not an American, but I speak the same language and use the same Internets so therefore I'm exposed to many of the debates going on over there. One in particular has haunted my thoughts in the last few days even more than the war in Iraq and the debate surrounding healthcare reform, is the fact there's a debate about healthcare reform at all. Honestly, if people see the current system and they think it's not broken, or they don't want the government giving people public healthcare the way they have a public police force and fire departments, perhaps they should seek a mental health professional. If they can afford to, without insurance if they don't have it or in spite of having it because they've been denied. I could ramble on about the care and treatment my mum had for cancer for over 12 years, or the fact my sister was ill a few weeks ago and all she needed to do was flash her Aussie Medicare card here to get treatment and a prescription, but all I'll do is meekly admit that I thought the whole point of government was to help people, that medical care is a right under the United Nations' Universal Declaration of Human Rights and that ultimately we're discussing whether or not we believe our fellow brothers and sisters should live or die. For an issue with so much debate going on, it seems simple enough to me. Again though, I'm not an American so I don't know the details.